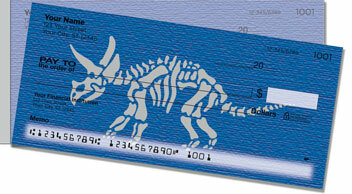 Gradient sandstone backgrounds give our Dino Skeleton Side Tear Checks a classic, weathered look that complements their Jurassic subjects. They're the perfect choice for indulging your inner (or outer!) 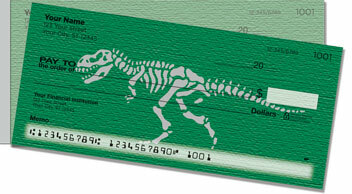 paleontologist every time you write a personal check! 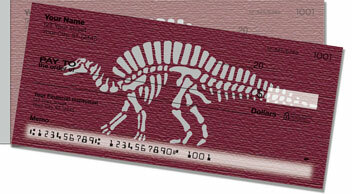 But besides their skeletal graphics, there's nothing prehistoric about these side-tear checks. 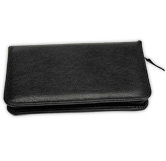 You'll love how easily they separate from the pad, thanks to their short-side perforation. It means your documents won't rip in the wrong place when you separate them from the pad. 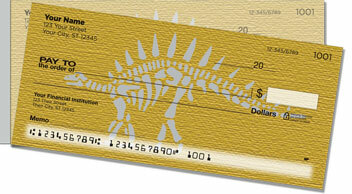 You can also choose this design as a set of return address labels to match your cool new checks. Personalize yours today!